Alexandra Burke is back in The Bodyguard at MK Theatre! THE BODYGUARD: IT’S GOT ROMANCE, SUSPENSE, HIT SONGS… AND ALEXANDRA BURKE! Milton Keynes Theatre is delighted that Alexandra Burke has returned to the starring role of ‘Rachel Marron’ in the international smash hit production of the award-winning musical THE BODYGUARD. Since winning the fifth series of The X Factor in 2008 Alexandra Burke has sold more than one million copies of her debut single, Hallelujah, in the UK, played leading roles in the West End and, in 2017, reached the final of Strictly Come Dancing. Alexandra returns to the role of ‘Rachel Marron’ following her triumphant run in the show in the West End and the subsequent sell out 2015/2016 tour. Based on Lawrence Kasdan’s 1992 Oscar nominated Warner Bros. movie starring Whitney Houston and Kevin Costner, THE BODYGUARD, directed by Thea Sharrock with book by Alex Dinelaris, was nominated for four Olivier Awards and has since played to sell-out houses all over the world. Former Secret Service agent turned bodyguard, Frank Farmer, is hired to protect superstar Rachel Marron from an unknown stalker. Each expects to be in charge but (spoiler alert!) what they don’t expect, is to fall in love. A romantic thriller, THE BODYGUARD features a host of irresistible classics including Queen of the Night, So Emotional, One Moment in Time, Saving All My Love, Run to You, I Have Nothing, I Wanna Dance with Somebody and one of the biggest hit songs of all time – I Will Always Love You. What a brilliant production this is! From its very lively start through many very clever set changes & special effects, sixteen great Whitney Houston songs, some very fine singing and dancing and as if that weren’t enough, its a thriller of some quality! You can forget Alexandra Burke XFactor Winner and replace that from now on with Alexandra Burke STAR! She carried us through the show assisted by a very talented supporting cast (loved the voice of Micha Richardson who plays Alexandra’s sister in the show) and a tight and witty script. Quite a performer is Alexandra, we were watching her as Rachel Marron, never once did my mind stray to Whitney Houston’s portrayal. Playing opposite Alexandra is French actor-singer Benoit Marechal and what a couple they make! Not only a fine looking actor, (He’s a successful International known model) he proved that he has a fine way with comedy too! Here’s an evening you really mustn’t miss and you only have until the 23rd March to acquire one of the few available tickets. On opening night the whole house was on its feet long before the end of the finale! 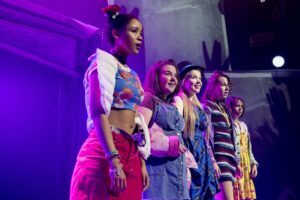 The musical stars Rachel Lumberg as Rachel, Alison Fitzjohn as Claire, Emily Joyce as Heather, Jayne McKenna as Zoe, AJ Bentley, Nick Carsberg, Curtis T Johns, Yazdan Qafouri and Sario Solomon, winners of BBC’s Let It Shine, as The Band, and playing the girls when young are Faye Christall (Rachel), Katy Clayton (Heather), Rachelle Diedericks (Debbie), Sarah Kate Howarth (Claire), Lauren Jacobs (Zoe) with Martin Miller as husband Jeff and Andy Williams as Dave. 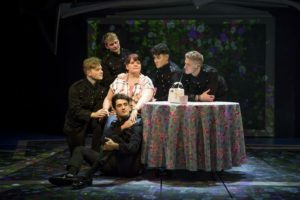 THE BAND is a new musical about what it’s like to grow up with a boyband. For five 16 year-old friends in 1992, ‘the band’ is everything. 25 years on, we are reunited with the group of friends, now 40-something women, as they try once more to fulfil their dream of meeting their heroes. If I’m honest, I wasn’t over excited about seeing this show, but had I not bothered I would have missed a real treat! The Band is something new, very different to the usual run of pop musicals. The script is sharp and very witty, there is a story – yes a real story! The packed Milton Keynes Theatre laughed, clapped, cried, cheered and at the end got up and danced! The sets work very well. The use of projection onto a conglomeration of different shaped screens was very effective, we even had a full sized passenger plane take off over our heads! The comedy and the pathos in an altogether excellent script by Tim Firth, were handled very well by an excellent cast led by Rachel Lumberg and Alison Fitzjohn. After a fairly low key start with just the younger girls, the arrival of Alison Fitzjohn as the grown up Claire is a theatrical experience you won’t forget! The winners of BBC’s programme to find the band itself can be more than proud of themselves as the sang and danced (and played a few other roles) dare I say as well as any boy band has ever done! An excellent night out. It’s not a tribute to Take That, it just uses their music. It is much, much more than an evening watching a tribute show. Go and see for yourselves – if you can get a ticket! If your idea of ballet is still ladies in tights and tutus and men in tights without them then you are at least 23 years out of date! It was in 1995 that Matthew Bourne changed the world of dance forever, winning over most of his critics before the interval of that opening night. These swans are aggressive, masculine and utterly believable! 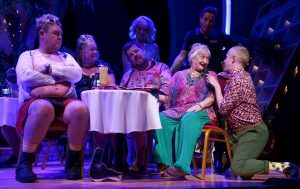 On the opening night at Milton Keynes Theatre the show featured Max Westwell as The Swan, Liam Mower as The Prince, Katrina Lyndon as The Queen and Carrie Willis as The Girlfriend. The audience were treated to this spectacular evening of beautiful music, fabulous sets and a brilliantly talented cast with a dancing prowess matched by their first class acting from start to finish. 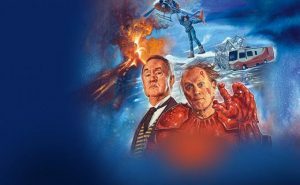 Matthew Bourne has tweaked this latest production, just enough to freshen it a little but not to upset those that don’t like change of any sort! The long standing ovation at the end of the evening proved just why Matthew Bourne’s wonderful direction fully deserves all the awards this production of the most popular ballet has already received – and those it will undoubtedly receive in the years to come! Shakespeare’s Much Ado about Nothing is at the Cambridge Arts Theatre from 23-26 January. Cambridge University’s The Marlowe Society, one of the university’s most acclaimed dramatic societies, returns to Cambridge Arts Theatre after a string of successful productions in recent years including Romeo and Juliet and Edward II. This year will see The Marlowe Society perform Much Ado about Nothing, one of Shakespeare’s most popular comedies. Marrying sharp witticism with edge, Much Ado about Nothing introduces us to two of Shakespeare’s most loquacious lovers: Benedick and Beatrice. 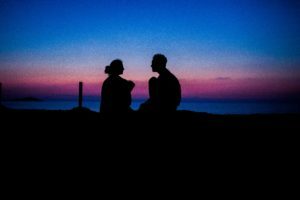 A vivid and compelling tale, this romantic comedy explores the transcendent nature of love and its capacity to overcome the obstacles of family, society, honour and deception. Richard Beecham, who will direct Much Ado About Nothing, has directed productions across Britain and on tour, including productions at The Old Vic, Theatre Royal Bath and the Watford Palace, where he was nominated for Best Director in the Off-West End Theatre Awards for Broken Glass, as well as receiving a nomination for UK Theatre Awards’ Best Production for Dancing at Lughnasa and a nomination for Manchester Theatre Awards’ Best Production for Rose. The Marlowe Society has launched the careers of some of Britain’s greatest actors including Sir Ian McKellen, Tilda Swinton, Tom Hiddleston and Derek Jacobi, and continues its tradition of showcasing the best theatrical talent at the university. This production by the very talented Marlowe Society is simply stunning! Avoiding the trappings of a complicated set, occasional props and lighting effects were used very successfully to depict the various scenes. They decided to bring the story right up to date – using, of course, the Bard’s original words. I was gripped from start to finish and it would be unfair to pick out any particular actor as the entire ensemble were as they should be, a close knit-team. The opening of act two with the not so bright members of The Watch was hilarious! Well done to all concerned – a production worth seeing – twice at least! Black Cat 107 available on fm around St Neots, DAB+ across Cambridge and on TuneIn on the internet. Adapted from Jill Murphy’s original much loved children’s books The Worst Witch is an action-packed stage adaptation with songs, music and magic for children aged 7+. Mildred Hubble, the good-hearted but accident-prone ordinary girl, begins her first year at Miss Cackles Academy for Witches. As she struggles to fit in, Mildred’s inevitable mayhem upsets her nemesis, fellow student Ethel Hallow and Deputy Headmistress Miss Hardbroom, just as an old enemy returns with a plan for revenge that threatens the academy and the world. Rain Man at The Arts Theatre – a triumph! Rain Man is at The Cambridge Arts Theatre from 8th – 13th October. 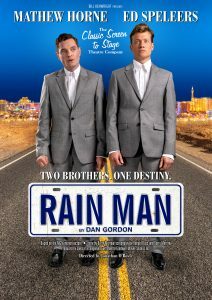 Based on the MGM motion picture · Story by Barry Morrow · Screenplay by Ronald Bass and Barry Morrow · Produced by special arrangement with Metro-Goldwyn-Mayer Studios Inc.
Bill Kenwright presents the inaugural Classic Screen to Stage Theatre Company production of Rain Man. Mathew Horne (Gavin & Stacey, The Catherine Tate Show) stars as Raymond Babbit opposite Ed Speleers (Downton Abbey, Wolf Hall) as Charlie Babbit. Inspired by the heart-warming Oscar-winning film, which famously starred Tom Cruise and Dustin Hoffman and won Oscar’s for Best Picture, Best Screenplay, Best Director and Best Actor, Rain Man follows previous acclaimed Bill Kenwright productions of films to the stage such as A Few Good Men, The Shawshank Redemption and Twelve Angry Men. 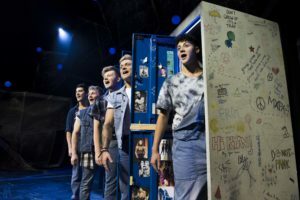 The production was directed by Jonathan O’Boyle whose credits include Rasheeda Speaking (Trafalgar Studios), This House (UK Tour); Pippin (Hope Mill Theatre/Southwark Playhouse); and Hair (Hope Mill Theatre/The Vaults) winner of the WhatsOnStage Award for Best Off West End Production. Rain Man is at Cambridge Arts Theatre from 8th – 13th October. I was lucky enough to see this production a little earlier in this tour, these were my thoughts…. When I saw the Bill Kenwright production of Cilla I thought it was his finest work so far – Rain Man is most certainly its equal. It is a beautifully told story, thanks to the book by Dan Gordon and Jonathan O’Boyle’s direction. A fairly basic set which transforms seamlessly from office to bedroom to casino never detracts from the actors. The very strong cast lead by Mathew Horne and Ed Speleers keep the audience entranced and completely immersed in the story. 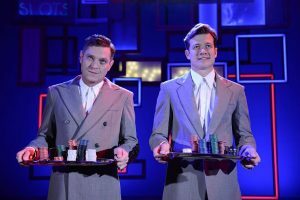 Although he’s done plenty of acting for the screen I was very surprised to learn that this is Ed Speleers’ stage debut! 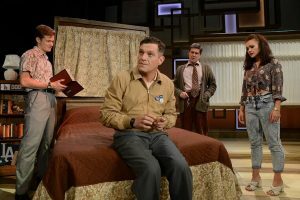 He gave such a strong performance – the perfect foil and complete contrast to Mathew Horne’s wonderful portrayal of Raymond, the adult autistic brother that has spent most of his life in an institution. I took with me a friend who teaches young adults with various forms of autism and he assured me that Mathew had obviously done his research as his performance was completely accurate. I urge you to get to see this amazing piece of work, try as I might I couldn’t pick fault with the tiniest thing. Congratulations to a superb effort from The Classic Stage to Screen Theatre Company and this particular cast and crew.